There are various departments within the civil service which were, you could say, family affairs. The Foreign Office was undoubtedly the department in which this practice was the most spread. Appointments to the diplomatic service were often based upon recommendations and who you knew. This resulted in British Consuls and Vice Consuls around the world being related in some way. The family who, arguably, implemented the foundations of the Foreign Office administration were the Hertslets - they were a family of librarians. After 1810 the Library also looked after the registers and indexes to the correspondence received by the Foreign Office and from 1816 the work included the preparation of memoranda. Lewis Hertslet was based in West London, moving to Richmond where he lived the majority of his life. His grandfather, J P Hertslet, was a King's messenger, delivering letters to Lord Malmesbury 2. This may explain Lewis' appointment as sub Librarian in the Foreign Office in 1801, aged just 13. By 1810 he had been promoted to Librarian and Keeper of the Papers. In 1822 the Librarian was supported by just the Sub Librarian - a lot of work for two people. The Library was responsible for the correspondence received from Embassies and Legations and the printed correspondence, known as the Confidential Print. While King George IV visited Hanover in 1821, Lewis acted as one of the Secretaries to the Lord Justice, during the King's absence 3. From 1824, Lewis was given the responsibility for the administration and supervision as the 'Superintendent of the Messenger Service and Controller of the accounts for the three Secretaries of State' - Home, Foreign and Colonial Secretaries. In 1854 this wide-ranging set of responsibilities was transferred to the Chief Clerk. The expanded role of the Library now saw the employment of the Librarian, sub Librarian and five supplementary clerks. As a young man in the Foreign Office, Lewis Hertslet started to expand his knowledge and influence. The expansion of British interests overseas saw a huge increase in the volume of correspondence received by the Foreign Office. With this extra work, Lewis suggested a registry and indexing system of the correspondence received by the Foreign Office. This was implemented in 1820, although amended slightly. These registers are now with The National Archives in the record series FO 802, and available as microfilms in the record series FO 605. The former system was restricted to the Northern and Southern Departments, but needed changing with the expansion of the Foreign Office. The suggestion also included a comprehensive index to the correspondence, but this wasn’t implemented until the recommendation of the Ridley Commission in 1891. These indexes from 1891 – 1905 are now in the National Archives record series FO 804. 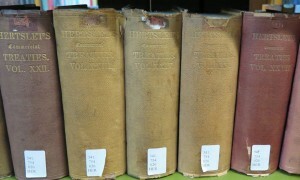 Following the introduction of a new registry system, implemented in 1906, the Library produced card indexes, and from 1920 these indexes were printed annually. Lewis also started to produce private pieces of work, mainly for the Foreign Office. 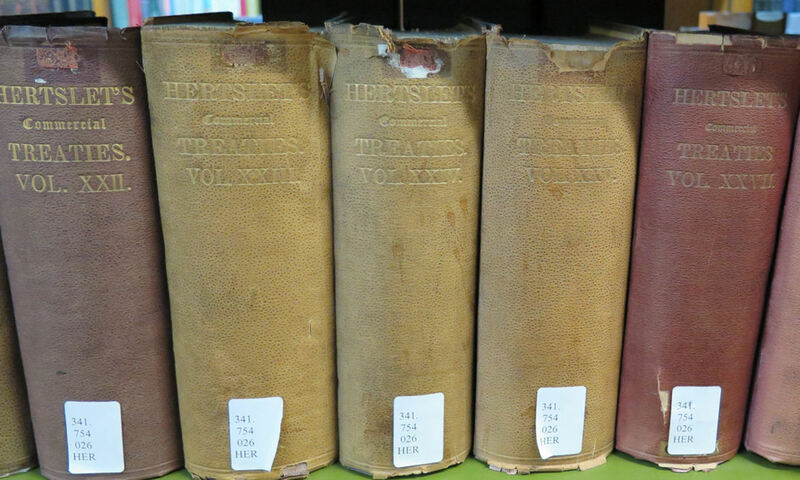 From 1820 he started compiling treaties and conventions, between Great Britain and foreign powers, and this work was called 'Hertslet's Commercial Treaties'. The other main piece of work written by Lewis Hertslet was the British and Foreign State Papers (from 1824). These works were intended to collect, in an easy and convenient source, a comprehensive collection of Treaties and Documents from 1815. These soon become popular and by 1922 was a single official Foreign Office publication. When Lewis retired in 1857 his son Edward Hertslet was promoted from Sub Librarian to Librarian. Edward was his youngest son and had followed his father into the Foreign Office. He attained a permanent appointment in 1842, and in 1844 became a Second Clerk. (This predated the reforms of 1848 which saw the role of clerk change and the introduction of examinations for those seeking the role of assistant junior clerk). Edward continued to edit the publications his father had started. His elder brother Sir Cecil helped with Hertslet's Commercial Treaties from 1871-1895. The British and Foreign State Papers eventually became a government publication. 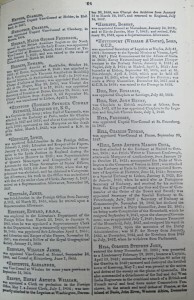 Edward was sole editor and proprietor of The Foreign Office List from 1865. This work included the names of British Diplomats overseas, statements of their service and deaths, the foreign diplomats in British territories, and examples of the examination papers undertaken by diplomats. This remains a particularly useful source for researchers. 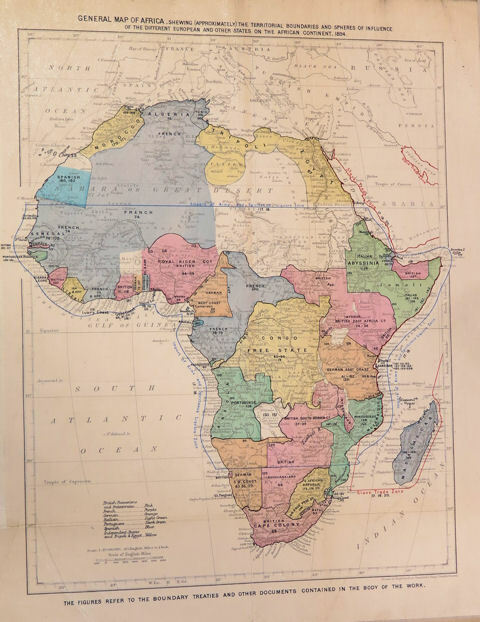 Other works were: The Map of Europe by Treaty and The Map of Africa by Treaty; and Recollections of the Old Foreign Office (1901). In June 1878 Edward was appointed acting secretary of the Embassy in Berlin. With his knowledge of treaties he was attached to the British Delegation to the Berlin Congress. Edward was awarded a Knighthood on 6 August 1878 in recognition of his work throughout the Congress. 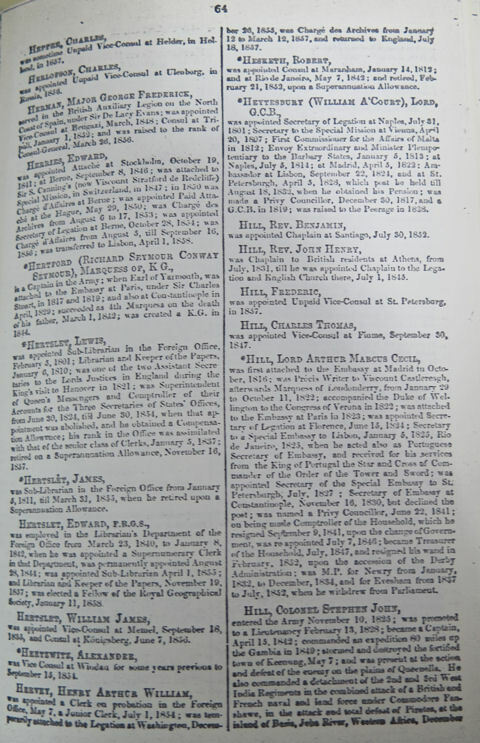 The Foreign Office List showing the service biographies of the Hertslet family employed in the Foreign Office in 1858. Lewis' eldest son, Edward Cecil, later Sir Cecil, joined the Chief Clerk’s Department in 1868. A distinguished career saw him appointed as Consul General to Antwerp where he spent the remainder of his career; even remaining at his post during the siege by German forces in 1914. He returned to Antwerp after the war and stayed there until his retirement, Sir Cecil also received an award from the Royal Humane Society 4. Reginald Henry Hertslet, Lewis' second son, started in the Library; appointed 2nd Class Clerk to the Treaty Department in 1882; He went on to become Consul at the Azores; and then Porto Rico. Reginald was appointed as Consul to Barcelona on 1 April 1894, but retired on 20 May 1894, without taking up his new position. Further records of the Hertslet family can be found throughout archives in the United Kingdom. You can find a list of material by searching Discovery, The National Archives catalogue and restricting you search to other Archives. The publication, Recollections of the Old Foreign Office, Sir Edward Hertslet, 1901, states there were four generations of the Hertslet family in the Foreign Office since 1795. There may be further families who left a lasting legacy on a government department, but few stand out like the Hertslet family.